We now know with Veeam U4 you can specify an application/json accept header and have your requests returned as a nice JSON payload which is neat. 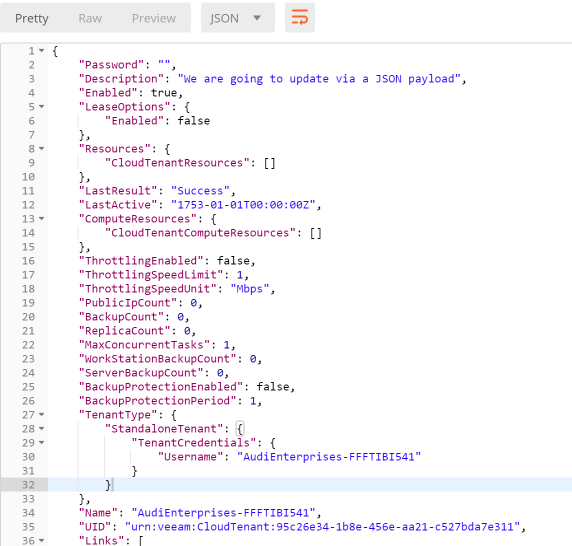 In a super basic example here is how to edit a CloudTenant using JSON instead of a XML payload, it also includes the new TenantType node which is required as of v1_4 of the API. If you re-fetch the CloudTenant you will see that the description has been updated with the new description, json end-to-end. nice!